Stepping out of your Element is a feature that we would like to do that will highlight Non-YA books, for YA lovers. If this is a feature you are interested in please be sure to say so in the comments! Also- if you know of a meme or feature already out there that is similar PLEASE let us know so that we may ask permission or give credit to the original creator. Source: I recieved a copy of this book from Jolly Fish Press in exchange for an honest review. All thoughts and opinions are my own. **We receive a small kickback from Amazon and Bookdepo purchases, all of which will go towards giveaways! This story came to me at the perfect time. I didn't want something totally YA, but I did want something light- hearted and fun! 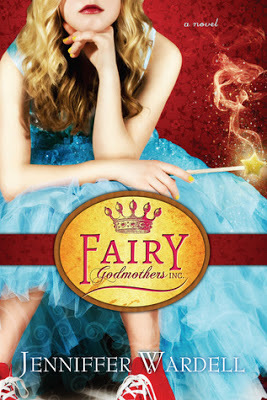 Fairy Godmothers, inc. is all kinds of quirky and addicting in a fantastic way! Filled with oddball characters that I couldn't help but love, I flew through the story and still wanted more. You can tell the author had fun with this story, though it's possible Rellie kinda took on a mind of her own! Making Kate jump through all kinds off hoops. - Rellie probably would have enjoyed seeing that for real - with her over the top dress and add ons. Think Glitter. no seriously GLITTER!!!!!!!!!! And glass shoes that have to appear glass, but not be glass, or plastic, or anything that could shatter. oh and somehow work in Bunnies. ya.. Have fun with that Kate! Jenniffer Wardell created a story that perfectly teetered on the edge of over the top hilarity. It was not too much, but it will have you literally LOLing multiple times. And while the title may make you think this is a story for younger readers, the perfectly placed innuendos will leave you smirking. Would be great for older YA readers and any adult reader looking for a relaxing and fun read. I look forward to reading more from this author. She did a great job of creating a story that kept you in the now, while sliding in a bit of backstory for the characters and overall world. The pacing was perfect and I never felt the need to set the book down even for one second! I was reading this story at work - SHH - and was constantly hoping the customers would stay outside and enjoy the sun, so I could stand there and read more! A few adult innuendos will not stop me from recommending this to teen readers. They are few, and honestly, you have probably heard worse at school! I hope a few of you pick this one up and enjoy it as much as I did! never heard of this book but it sounds really good! I'm stopping by from the Feature and Follow post! New follower via bloglovin' and twitter for both of you! I started this one, but haven't gotten all the way through it... time to pick it up again, it sounds like.